‘Ring’, Michael Stumpf (2014). Cast acrylic resin. Mackintosh Building, Director’s Balcony, GSA. Photo: Janet Wilson. ‘Ring’, cast acrylic resin, 2014. Michael Stumpf. Mackintosh building Director’s Balcony. ‘O’ can be seeing something in the round. Where is the object positioned in relation to you? Can you move round it? Can you see inside it? What information do you need to understand what it is you are looking at? 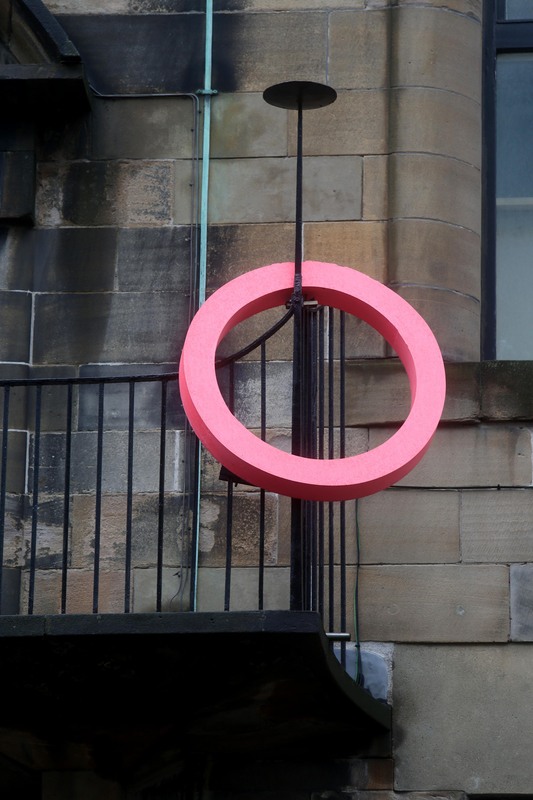 Included in the ‘O’ of this essay are references to Michael Stumpf’s past work, descriptions of his present work for Glasgow International at The Glasgow School of Art (GSA), some Sesame Street philosophy and other thoughts for you to include or exclude, as you encounter ‘This Song Belongs to Those who Sing It’. 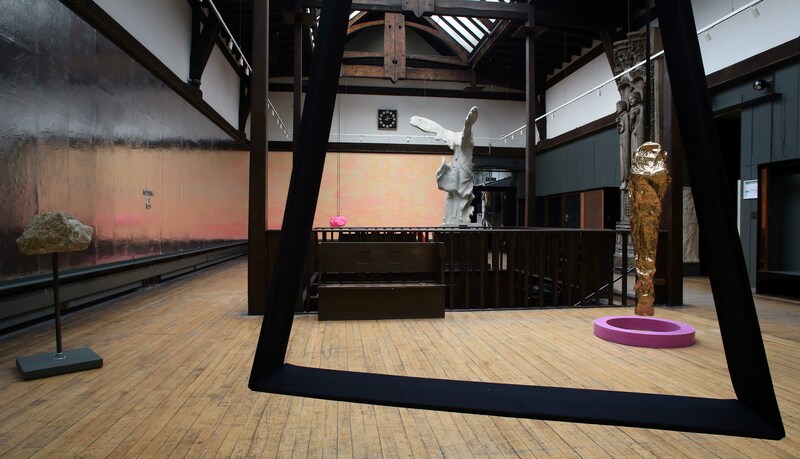 We first travel back to Michael’s exhibition ‘In My Eye‘ at the Pipe Factory, Glasgow in January 2014 . A projection screen was placed in the middle of the gallery. In this action by the artist, the viewer was able to encounter the screen as a three-dimensional object as it could be walked around. The film playing on the screen presented a sequence of objects which slowly revolve: a small brown vase spins against a black backdrop; the camera circles an abandoned men’s black tap shoe. We are shown the surface of these two objects with the sheen of the glaze and the soft black leather and metal toe tap. We are then reminded that these objects have an interior as both begin to quietly emit smoke. The act of filming explores the object in a different way. I am reminded of ‘In My Eye’, as we make choose the image for the GSA poster and invite for ‘This Song Belongs to Those Who Sing It’. Rather than repeat the same digital image across both, Michael decides to use the two flat surfaces to show front and back view of the same sculpture ‘The Sound of Silver‘ (2010). ‘Sound of Silver’, Michael Stumpf (2010). 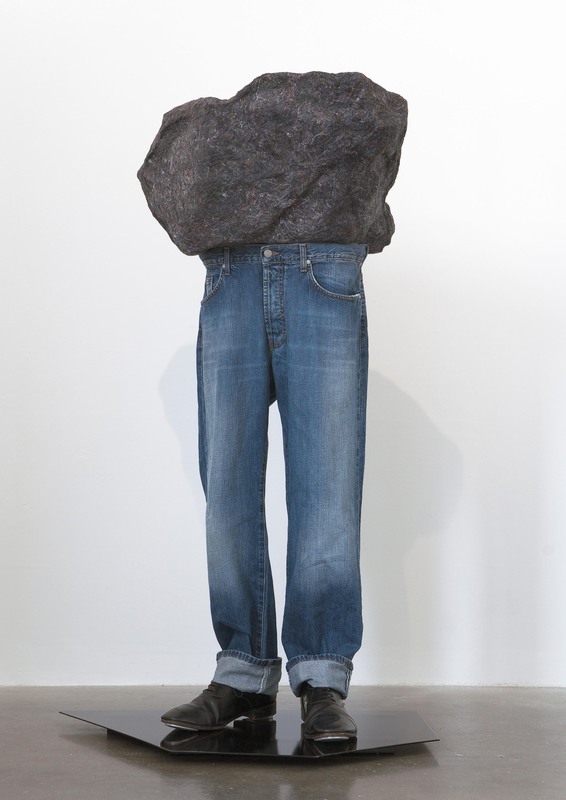 Recyled fabric, acrylic resin, denim, tap-shoes, powder coated steel. Front view. ‘Sound of Silver’, Michael Stumpf (2010). Recyled fabric, acrylic resin, denim, tap-shoes, powder coated steel. Back view. Michael likes us to see things from different angles and to be aware of looking, “to see things in the round”. This can often be reflected in his choice of title. For the Pipe Factory exhibition it is ‘In My Eye’. 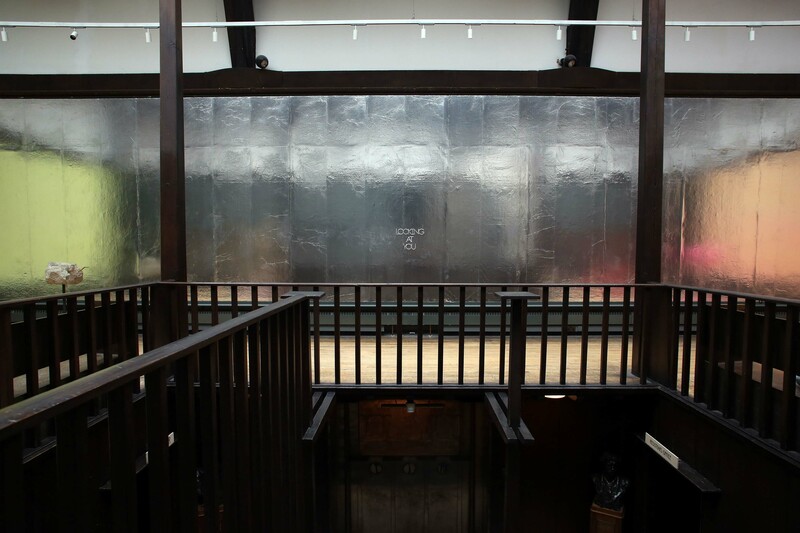 In the Mackintosh Museum there are two pewter word sculptures separated by the void at the heart of the space, itself an inverted architectural ‘O’. One says’Looking at me’. The second says ‘Looking at you‘. What are we looking at in the Mackintosh Museum? Does it look back? The silver foil creates a smooth new skin on the longest wall. It offers up a new depth in the room. To the left, the reflection of the yellow-washed side wall folds back through the silver into infinite space. The painted right hand-side wall is reminiscent of a dawn or sunset, with the Mackintosh Museum’s resident headless Nike ‘facing’ towards this landscape composition. Both colour walls create a glow upon the burnished copper of the two Museum display cabinets which have been revealed for this exhibition and treated like sculptural objects. The polished glass on the case to the left of the director’s doorway becomes a mirror. The dark denim panel inside it provides a clear back drop and depth. Looking at me. There are no glass panels on the display case on the right. It is the same but different. 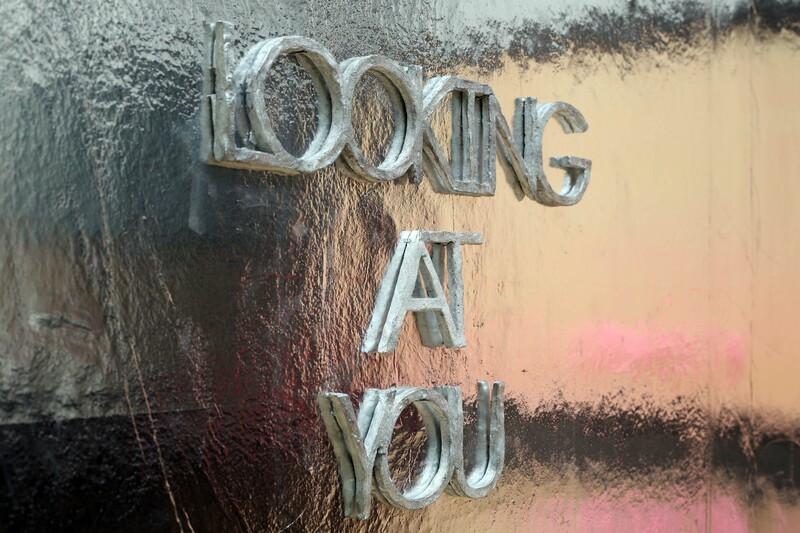 ‘Looking at me’, Michael Stumpf (2014), detail. ‘This Song Belongs to Those who Sing It’, GSA Photo: Janet Wilson. 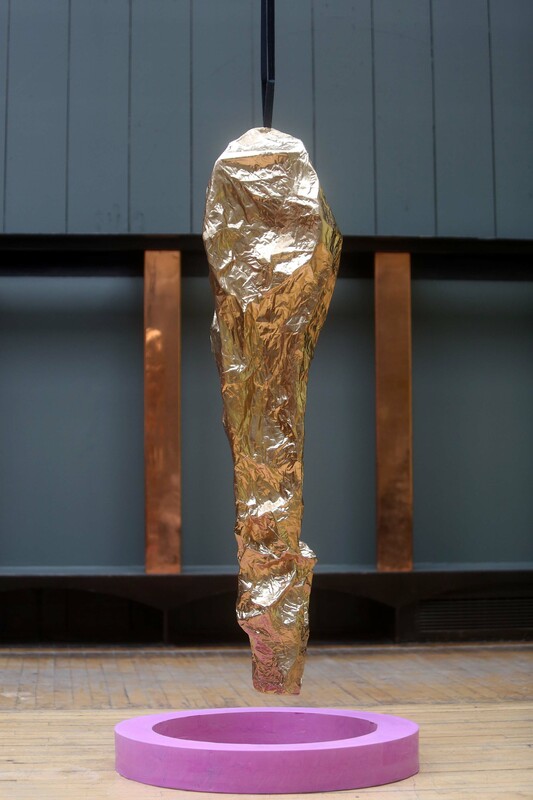 ‘Perplexed’, Michael Stumpf (2014), ‘This Song Belongs to Those who Sing It’, GSA. Photo: Janet Wilson. Paper, calico, aerosol paint, denim, acrylic-resin, steel, tube clamps. 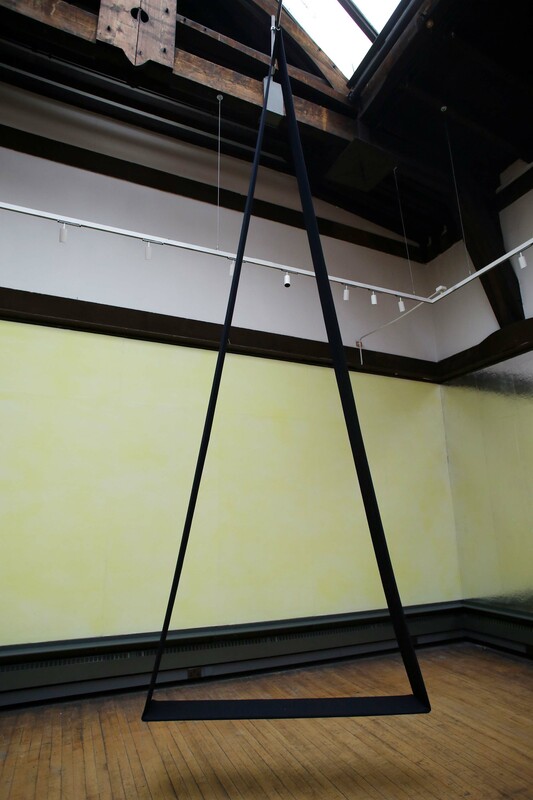 The three suspended works from the beams hang low to the floor, allowing us to circle them. Each of the works in the Museum has a different relationship to our body, as we look and relate to it. Is it recognisable? What size are we in comparison to it? Does it change relating to where we are positioned? A gigantic denim triangle draws the eye up to take in the volume of this space. ‘Endless long bowed phrases’, Michael Stumpf (2014). Denim, plywood, steel, tube clamp. ‘This Song Belongs to Those who Sing It’, GSA. Photo: Janet Wilson. Both the Mackintosh building and Michael take a non-linear approach to time. There is a strange circular timeframe in the Mackintosh building where past, present and future co-exist all at once. Michael talks about trying to move differently within an artistic practice – “not to get sucked into following the one line”. He both revisits past works and ideas whilst moving forward in his practice, viewing materials and methods as an alphabet which can be drawn from. Small forms can potentially be big. A chain which appears graphically on the front of a past work called ‘Sweats‘ (2012), becomes a three dimensional work for this project. 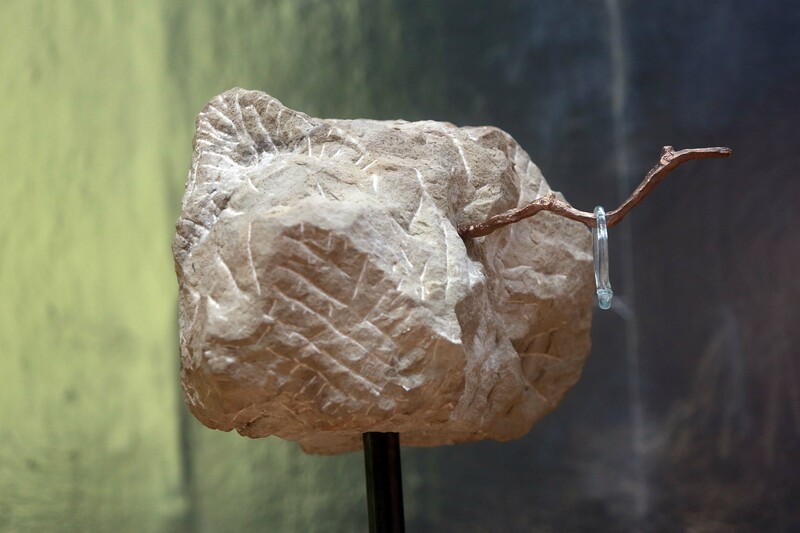 ‘SWEATS Lovesong; Song (ring, chain, rope, nail, rock)’ (2012), Michael Stumpf. 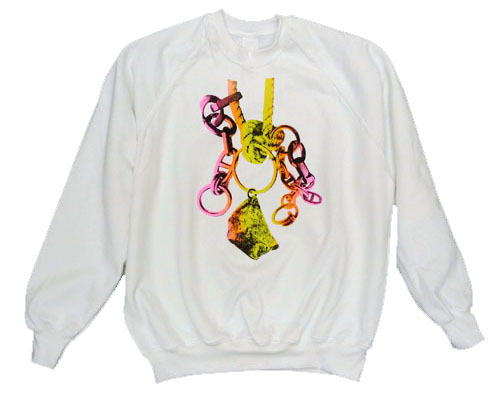 Ongoing series of screenprinted sweatshirts. 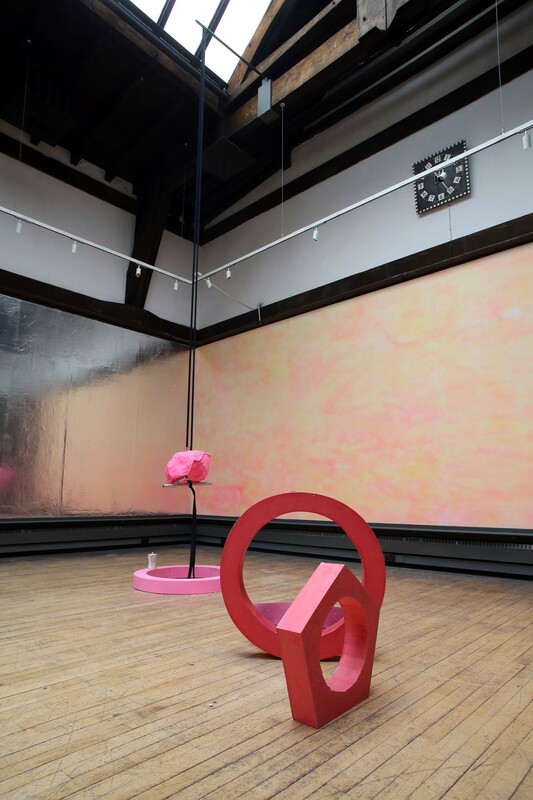 The links from the chain move from exterior to interior – as a single ‘O’ outside on the Mackintosh Building’s Director’s Balcony and as a communal gathering inside the Mackintosh Museum on its floor. 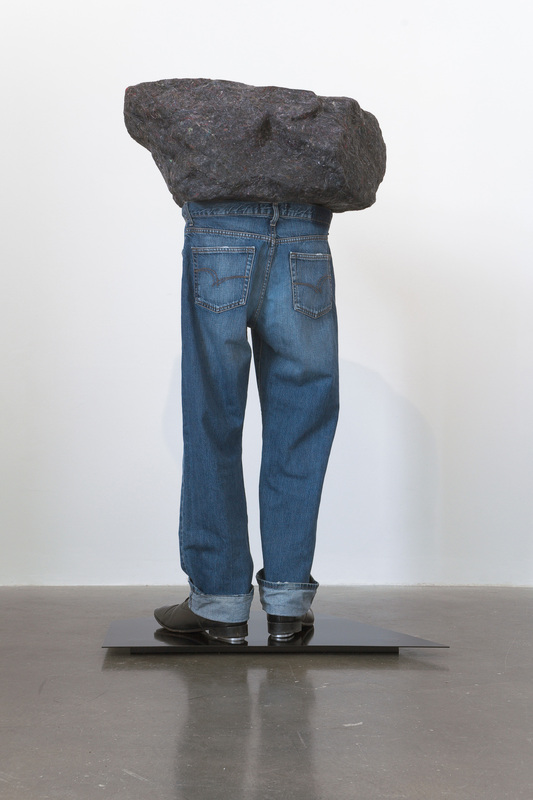 Denim, the ‘everyman’ material and stone often appear in different forms throughout Michael’s work. Stone occurs as an ordered section of wall in 2005, on which two polo shirts rest  then in 2012/13 as the archaeological strata from which different objects protrude . 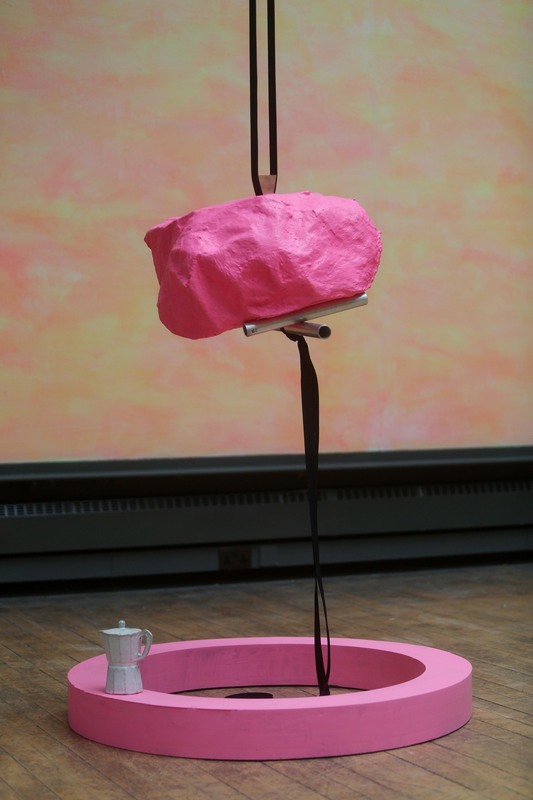 Here in the Mackintosh Museum in 2014, we see the ‘mother’ stone, sandstone which has been chiselled, and also a pink cast from the stone which is suspended from the beam. Michael also includes a small vase he made in the 1980s which his mother has sent over for the exhibition. ‘Song (Ring, Twig, Rock), sandstone, cast bronze, glass, steel, tube clamp (2014), Michael Stumpf. ‘This Song Belongs to Those who Sing It’, GSA. Photo: Janet Wilson. ‘Called Upon’, Michael Stumpf (2014). Paper, denim, acrylic resin, aluminium, glazed ceramic steel, tube clamps, wood. ‘This Song Belongs to Those who Sing It’, GSA. Photo: Janet Wilson. For ‘The Balconies Commission’ here at The Glasgow School of Art, Michael was invited to work with the new pairing of the Mackintosh Building and the Reid Building. 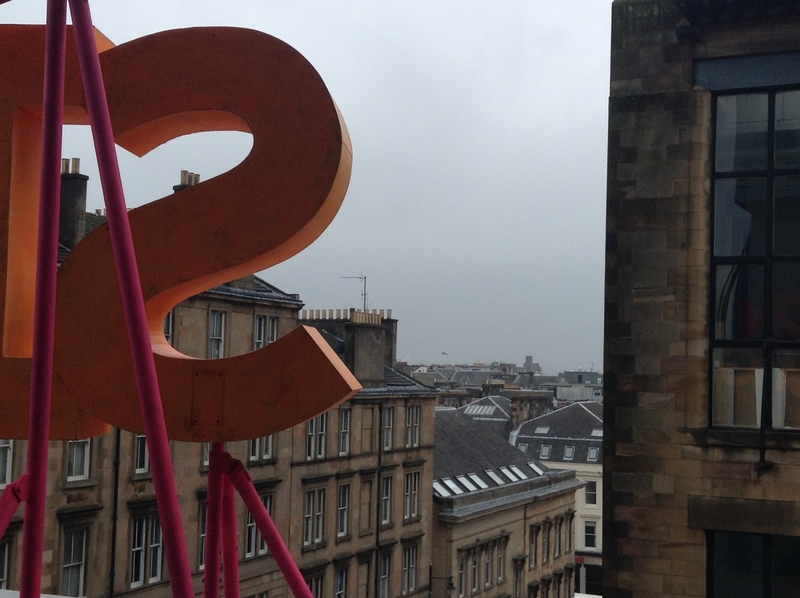 The resulting text sculpture NOW SING sits on the Reid Building balcony and can be viewed as a street scene with its corresponding neighbour, the ‘O’ on the Mackintosh Balcony. Architect Steven Holl, designer of GSA’s Reid building, wrote ‘The Alphabetical City’ in 1980. It examines how city buildings in USA conformed to different letter types depending on the shape of the site. There are ‘T’, ‘I’, ‘U’, ‘O’, ‘H’, ‘E’, ‘B’, ‘L’ and ‘X’ types of housing. ‘O’ Type Housing has an enclosed communal space at its centre. If we view the ‘O’ architecturally as having the space inside, the outer walls and the space beyond it, Michael’s work for this exhibition is situated at three points- inside the Mackintosh Museum, on the exterior of the Mackintosh Building, then over the road on the Reid Building balcony.This Song Belongs to Those who Sing It should be considered as an exhibition across an expanded field. 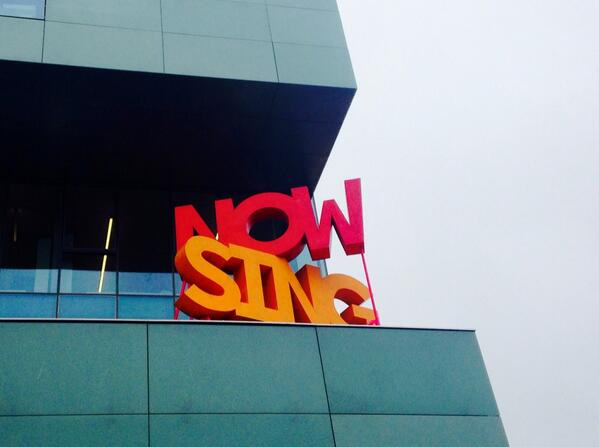 The words ‘NOW SING’ have been handmade by the artist – a truly monumental endeavour. The orange of NOW and the pink of SING echo the beginning and end of one day . To say NOW is strange, because as soon as it is said, it is in the past. The viewer will walk past NOW SING on the way in, and see NOW SING, later on the way out. 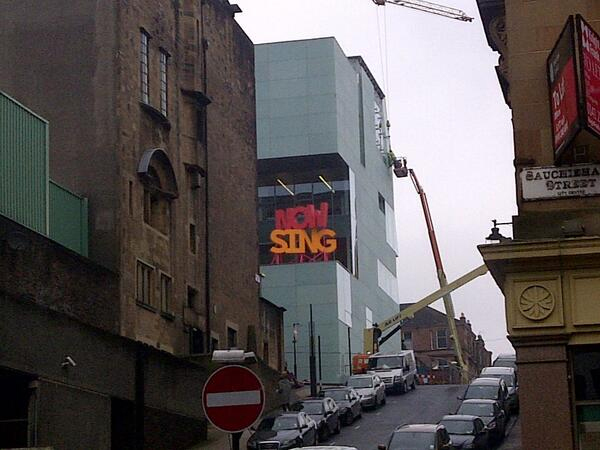 NOW SING could be directly asking something of us or be a declaration of intent for the new building. Looking across to the Director’s Balcony on the Mackintosh Building, the ‘O’ placed on the railing is an open mouth on the façade . After all, ‘façade’ is derived from the French for ‘face’. 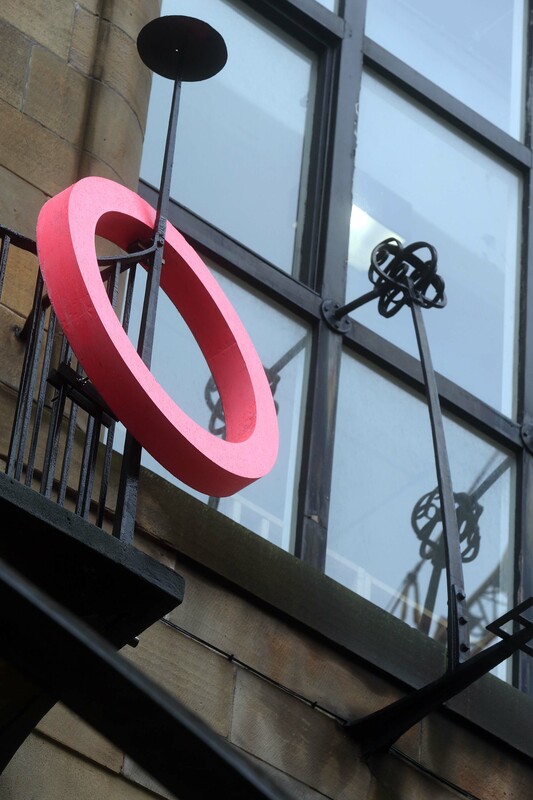 The ‘O’ also mimics the circular shapes of Mackintosh on the building’s iron work or even the glass globes on the Mackintosh weathervane. Look up. It is also like the ‘O’ of the ‘driven voids’ which are three architectural features to be found in the Reid Building. Early on, Michael visited our Exhibitions office and showed us a Vimeo excerpt of Gregory Hines and his brother Maurice presenting ‘Near and Far’ for Sesame Street. Maurice says, “Now this is near“. Gregory then tap dances in a circle around him, and continues to tap across to the back of the set. He then says “Now this is far“. They swap positions, in order to emphasise that in these pairings, they only make sense if one is in relation and oppositional to the other. Each time they trace a circle round each other before one moves off. Dr Sarah Lowndes has said of Michael’s work, “It is the essential thing-ness of his objects that is the most striking aspect of his practice”. I like the word ‘thing-ness’, which could be seen as serious and playful at the same time. On one hand, in grammatical terms, ‘thing-ness’ is a derivational suffix of ‘thing’. A derivational suffix takes a word as a source or origin and then adds to it. Sing – Singer – Song. Michael chooses a material from his alphabet then adds to it. On the other hand, ‘thing-ness’ sounds like a Big Bird word. ‘This Song Belongs to Those who Sing It’ is a communal offering for the architecture, its passers-by, The Glasgow School of Art community and its visitors. Jenny Brownrigg, Exhibitions Director, The Glasgow School of Art. April 2014. Text for: ‘This Song Belongs to Those who Sing It’, Michael Stumpf 4 April – 4 May 2014. Sesame Street – ‘Alphabet Chat Letter O’. Sesame Street -‘Big Bird and the Letter O’. 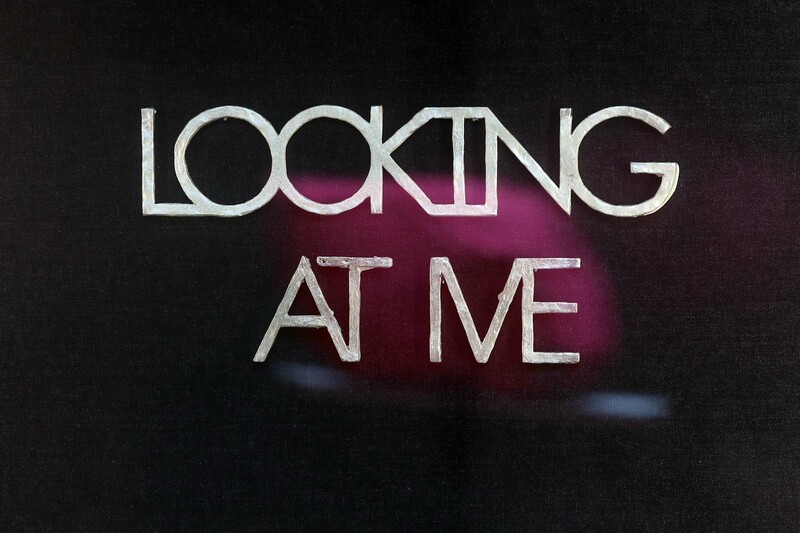 ‘In My Eye’, Michael Stumpf 30/1 – 1/2/14, Pipe Factory, Glasgow. Sesame Street Lyrics – ‘Elmo Sings “Right in the Middle of the Face”’. René Descartes, ‘Discourse on the Method’, 1637. Collective Gallery, as part of New Work Programme, 2005. ‘This rhyme is 4 dimensional’, Michael Stumpf (2004-2012), shown in ‘Last Chance’, SWG3 Gallery, Glasgow. 8/12/12-19/1/13. Michael was classically trained as a stone mason before art school, so stone was a trade material for him before a creative material. Sesame Street Lyrics – ‘The O Song’. Text sculptures which declare, as an object, their own purpose or state have been a recurrent theme in Michael’s work. ‘Massive Angry Sculpture’ at Glucksmann Gallery in 2011 and ‘Fade to Black’, made at Scottish Sculpture Workshop in 2009 and shown in Leith Hall Gardens in Kennethmont, Aberdeenshire, are two examples of this strand in his practice. Sesame Street – ‘The Kingdom of ‘O’. Observation by Talitha Kotzé, The Glasgow School of Art Exhibitions co-ordinator. Sesame Street Lyrics – ‘One of These Things’. 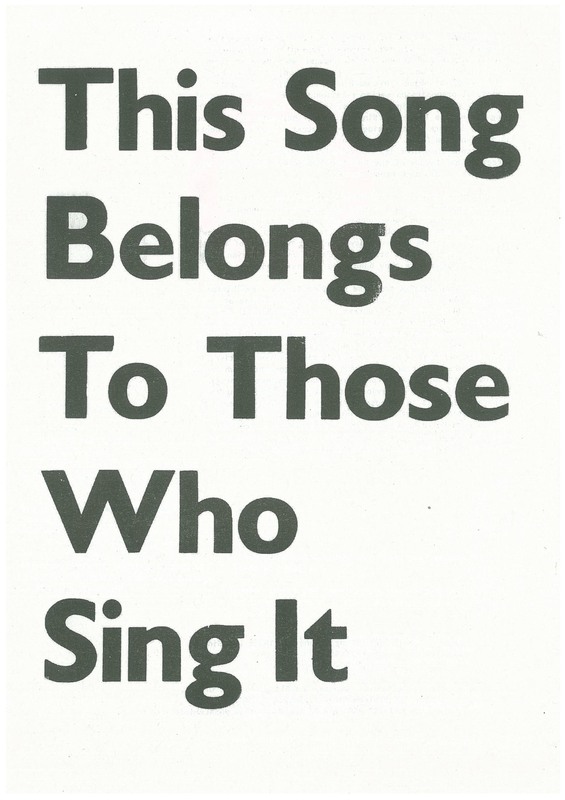 ‘This Song Belongs to Those Who Sing It’, Michael Stumpf (2014). Leaflet, cover. 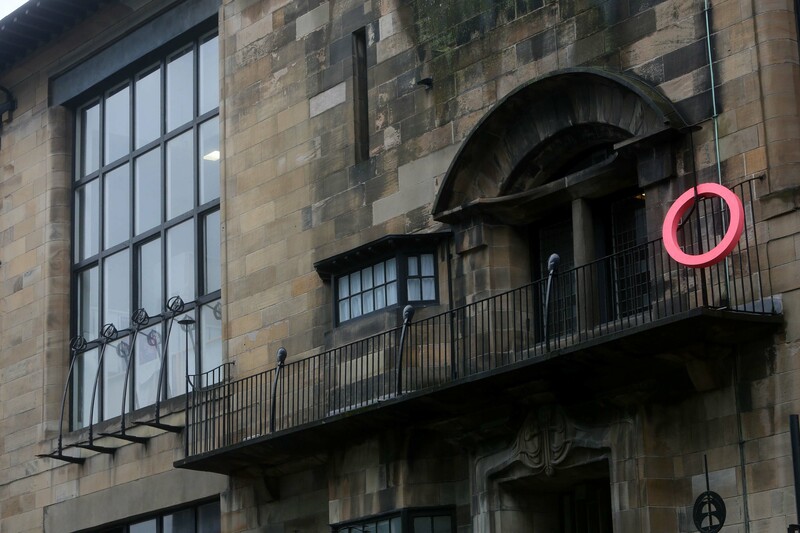 This entry was posted in Curation, Writing and tagged 'This Song Belongs to Those who Sing It', Balconies Commission, Glasgow International 2014, Mackintosh Building, Mackintosh Museum, Michael Stumpf, Now Sing, Reid Building, The Glasgow School of Art. Bookmark the permalink.